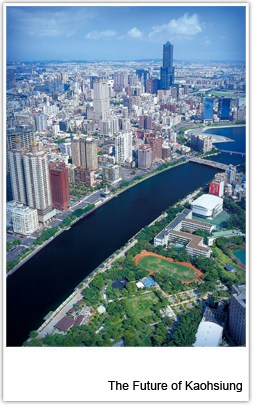 Kaohsiung is a tropical, coastal port city of the Republic of China on Taiwan. Besides its warm and pleasant climate with abundant sunshine, Kaohsiung boasts an international seaport, an international airport, rapid, convenient transportation systems, and the largest land area of any special municipality in Taiwan. When Kaohsiung hosted the World Games in 2009, more than 5,000 volunteers and local citizens enthusiastically took part in making the event a success. Both the physical infrastructure of the games venues, and the meticulous organization, were widely praised, and Ron Froelich, president of the International World Games Association, described the 2009 World Games in Kaohsiung as “the best games ever.” This is not only a source of pride for Kaohsiung, but also an honor for Taiwan. At the end of 2010 the former administrative districts of Kaohsiung City and Kaohsiung County were combined, thus enlarging Kaohsiung City’s land area from 153 to 2,946 square kilometers and increasing its population from 1.53 million to 2.77 million. A territory and population on this scale are sufficient to compete with international cities such as Tokyo, Seoul, Hong Kong, Singapore and Shenzhen. I sincerely invite you to get to know Kaohsiung, an Asian city that is brimming with warmth and enthusiasm, and is making every effort to innovate while maintaining its traditions. It is a place that is most definitely worth your while to visit, to experience, and to invest in.